Antinos, Youngster Joey, EpochEmu and 1 other person like this. Matt N and DelPiero like this. Antinos, Aaron Smith, EthanCoaster and 1 other person like this. Antinos and Matt N like this. 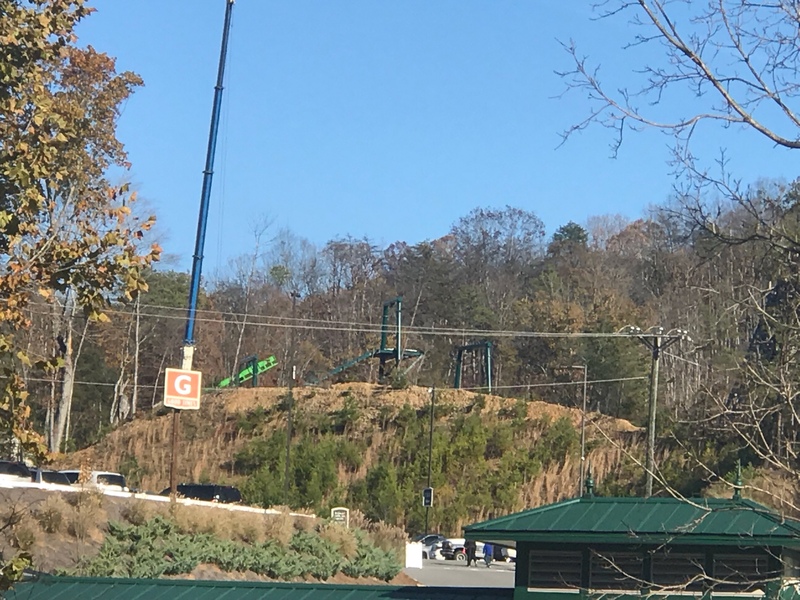 "Dragonflier will run with one train"
Not a whole lot to say quite yet...but the light green track paired with the dark green supports is going to look excellent as this takes shape. Climate controlled play! My favourite. Lofty and EpochEmu like this. Wasn’t aware we had CF at the park the same day we were there, but thought I’d throw my photo up anyway. Having seen the area myself it’s a pretty nice size, they’re really making construction progress on it too. Since I caved and bought a season pass upgrade I’m sure to be back, can’t wait to see it finished! It's much farther along than the pics show. I was there yesterday. By the end of the day, they had the entire lift hill and the drop in place. The whole area was actually looking great. The coaster is moving quickly but they also have several building completed already. Considering its November and they were lifting track into place as we rode by, they're not waiting for anything. Yeah, seeing the site in person really allows you to get a good feel for the amount of space they've cleared in addition to the terrain involved. There's still quite a gradient as the clearing moves up the hill towards Mystery Mine. It'll certsicer be an exciting spot to watch as they continue to expand towards the train tracks. That's pretty much what it looked like when i went to the park last weekend, only they had just finished the drop. EpochEmu, Jaiden M., Matt N and 2 others like this. I like the look of this layout. The only family SLC's I've done are the Carowinds/Kings Island model and the one at Fun Spot Orlando. Those were okay but this definitely seems like a step above those. I’ve done the one of these at Fårup Sommarland and it’s a fab ride, so smooth with some great forces! This will be great, hopefully they theme it to the hilt!